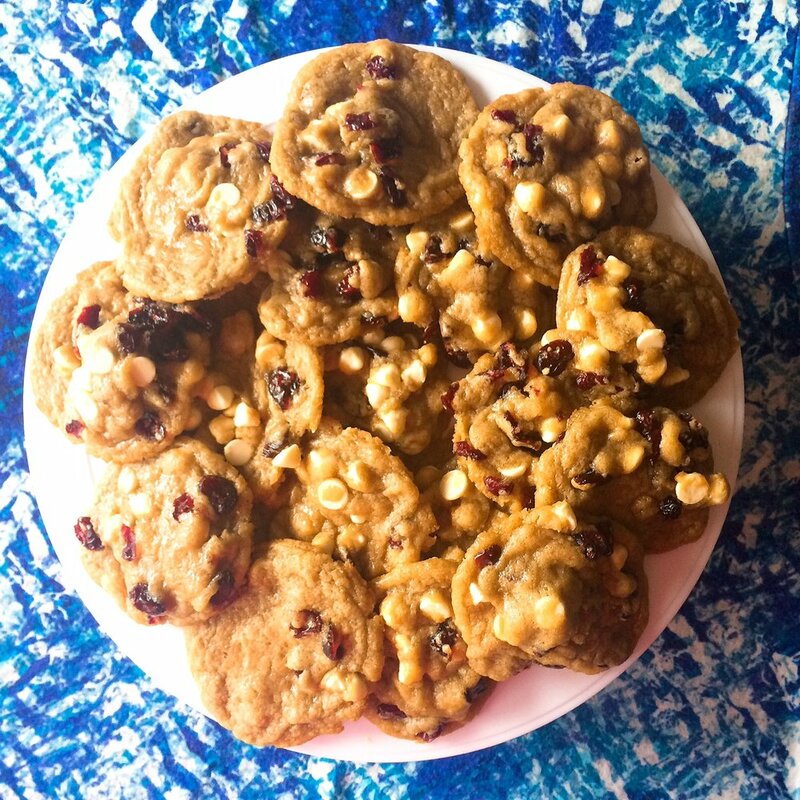 Sweet white chocolate chips complement tart, dried cranberries in these chewy cookies packed with brown sugar. The red and white combination is perfect for your patriotic summer celebrations! If you live in the great old U - S - of - A, then you had the Monday-est Tuesday ever yesterday!!! ...I mean, you celebrated the brave heroes who made the greatest sacrifice fighting for our country. That's it. And seriously, SO MUCH APPRECIATION for the service of everyone who fights for this country! How did you spend your lovely day off work? Did you barbecue? Did you wear white pants and start your countdown clock to Labor Day? Did you wear white pants and spill ketchup all over them at your barbecue? Don't worry, bleach will take that right out! Oprah says so, or the internet, or something. Probs Oprah. I was supposed to go to a barbecue, but things at my grandparents' place ended up going all wonky at the last minute. I found myself at home instead, pondering my existence. Typical Monday. Now, if there's one thing I've learned in life, it's that when one door closes, another door opens. 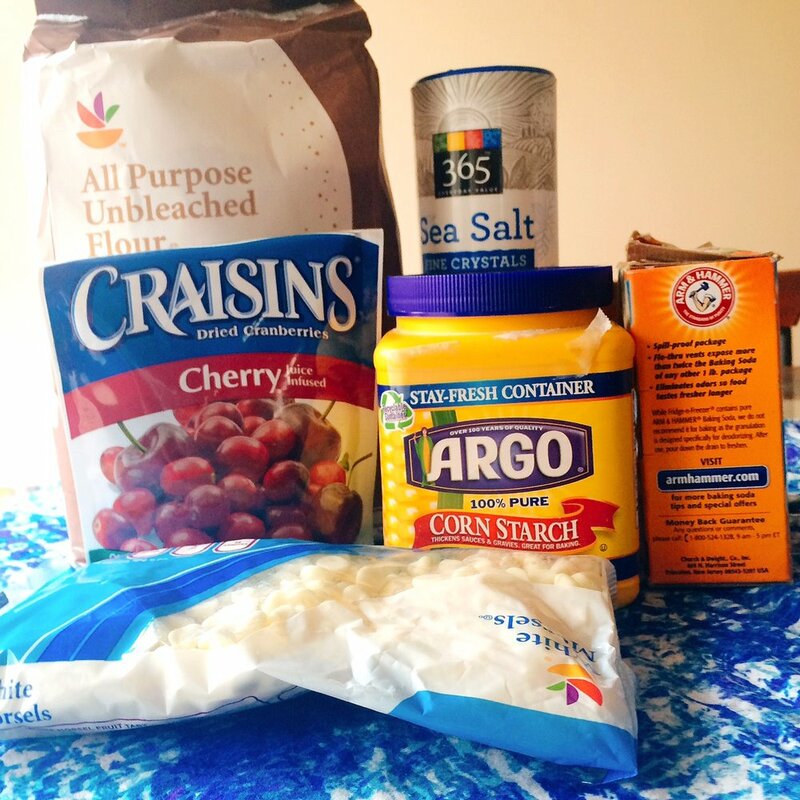 First, whisk together your dry ingredients: the flour, baking soda, salt, and cornstarch in a medium bowl. Set this aside. Next, combine your softened butter, brown sugar, and granulated sugar in a large bowl until uniform. To this mixture, add the egg and vanilla. Combine fully, then gently fold in the dry ingredients just until no streaks of flour remain. 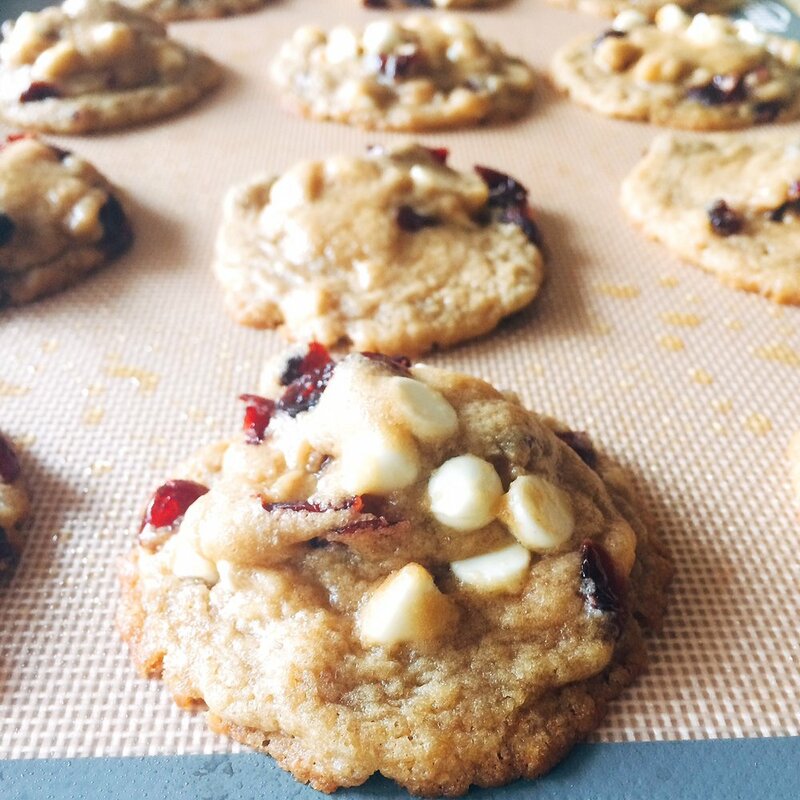 Finally, gently mix in the cranberries and white chocolate. How easy was that?! Magic, I tell ya. Cover this bad boy with plastic wrap, set it in the fridge, and forget about it. Seriously, go to a barbecue or the gym, or get caught up in The West Wing, or study for the CISA for a million and a half hours (what I did), until at least two hours have passed. The longer you wait, the more the flavors will develop! When you can't stand it any longer, preheat the oven to 350F. 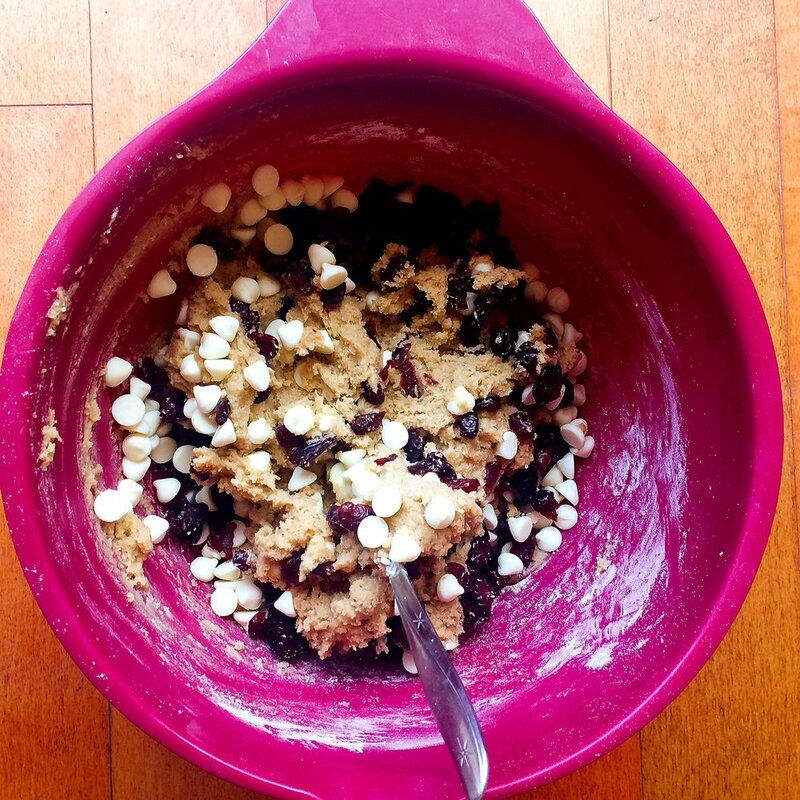 Scoop the cookie dough out onto a lined baking sheet in 2T-sized balls, then pop them in the oven for 9 minutes. No more!! 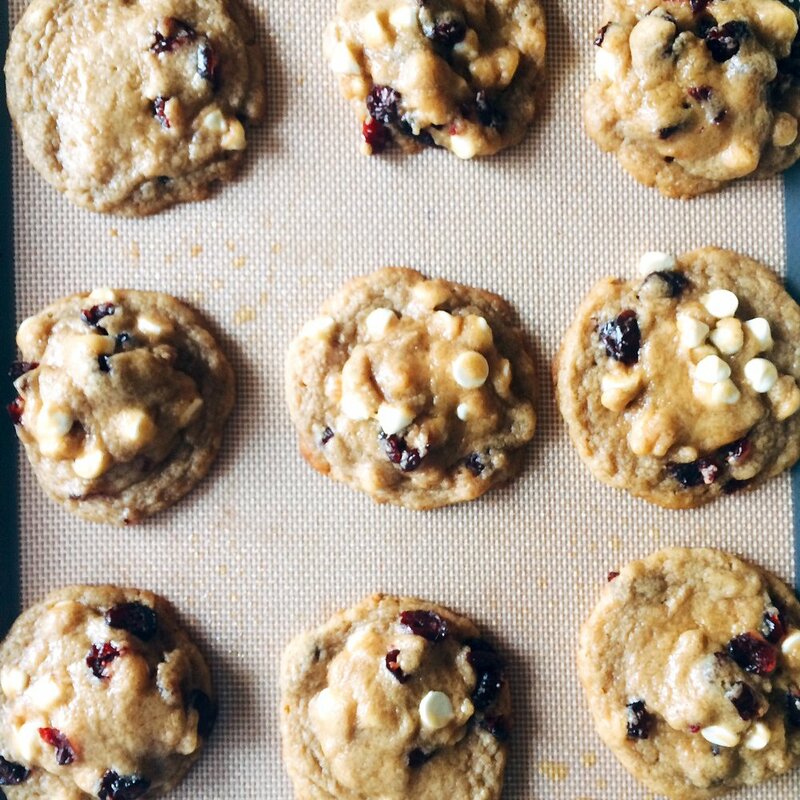 They may look puffy and under-done, but that's going to give them the soft, chewy texture we're going for. Let them cool on the baking sheet for 10 minutes, and then transfer to a rack for another hour or so. Then, dig in! Land of the free, home of the MOST delicious cookies, am I right? !